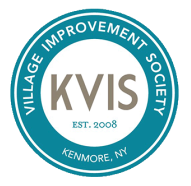 The KVIS welcomes newborn children to the Village by giving each newborn child (that we know of) a quality cotton onesie for 3-6 month old babies. The garment says ‘Made in Kenmore’ on the front of it and is a gift from the Welcoming Committee. If you or anyone you know who lives in Kenmore are soon to be parents of a new born, please contact the KVIS and we will make sure they receive a onesie. Our Made in Kenmore Onesie Initiative Coordinator is KVIS member, Lee Ann Vogt.